Last season, the Detroit Red Wings made it into the post season for a 20th consecutive season, by winning the Central Division title with 104 points. 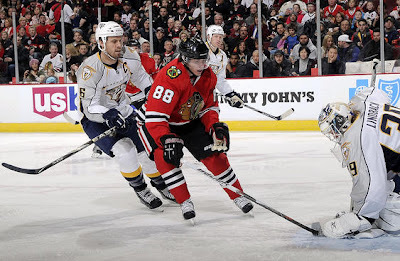 While the Nashville Predators and Chicago Blackhawks both made it into the post season, with 99 and 97 points respectively. The remaining two teams in the conference, the St. Louis Blues and Columbus Blue Jackets, failed to make the playoffs, something that has not been done for either team since the '08-'09 season, where both teams were eliminated in the first round. A representative of the Central Division has won the Stanley Cup two of the last four seasons, in '07-'08 when the Red Wings hoisted the Cup, and most recently in '09-'10 when the Blackhawks ended their championship drought. So far the division seems pretty damn competitive. The Red Wings and Blackhawks obviously get the majority of the attention and spot light that is given to the Central Division. With two Cups, players like Pavel Datsyuk, Patrick Kane, Jonathan Toews, and Henrik Zetterburg fresh in our minds, why wouldn't they. They have two of the richest and most successful histories in the league, and have rosters that will keep winning seasons in the futures of their organizations. However, there may be a few new kids on the block, the Predators, Blues, and Blue Jackets, trying to steal their thunder. The biggest hope for these new kids to make a name for themselves may be the Nashville Predators. Putting together perhaps one of the best smothering defenses in the league, the Predators have gotten "Smashville" into the playoffs in four of the last five seasons, and their first playoff series win in franchise history, last season. Since recently locking up team captain, Shea Weber, and his beard, for another year with the Preds, they have a strong and youthful core that can shut down top offenses through out the league. A little development from their young stars and this team could be lethal. The Blues on the other hand took a different route in taking steps towards dethroning the central division powerhouses. They brought in veteran leadership and offensive depth in bringing Jamie Langenbrunner, Scott Nichol, and Jason Arnott, into a young locker room that could use some guidance. Players like T.J. Oshie and David Backes could really benefit from having a teammate or two who has been around the league as long as the aforementioned. Finally, the team in the division that has always seemed to have the potential but has never really hit all cylinders consistently, the Columbus Blue Jackets. This team has disappointed the hopeful on many occasions. However, this off season the Jackets may have grabbed the supporting cast that star forward, Rick Nash, has so desperately needed. Jeff Carter, James Wisniewsky, and Vinny Prospal all came to Columbus during the off season and will likely compose the best offensive threat the team has ever put forward. Obviously when looking at the Central Division, you see a guaranteed six games against both the Detroit Red Wings and Chicago Blackhawks. That fact alone would make most fans cringe. However, this division has a lot more depth than most would think, and with off season acquisitions this division should only get better next season. Watch for a new team to take the reign as the Central Division's top dog next season. My money is on the Preds.